YouNow, a live-streaming social network, is making stars. 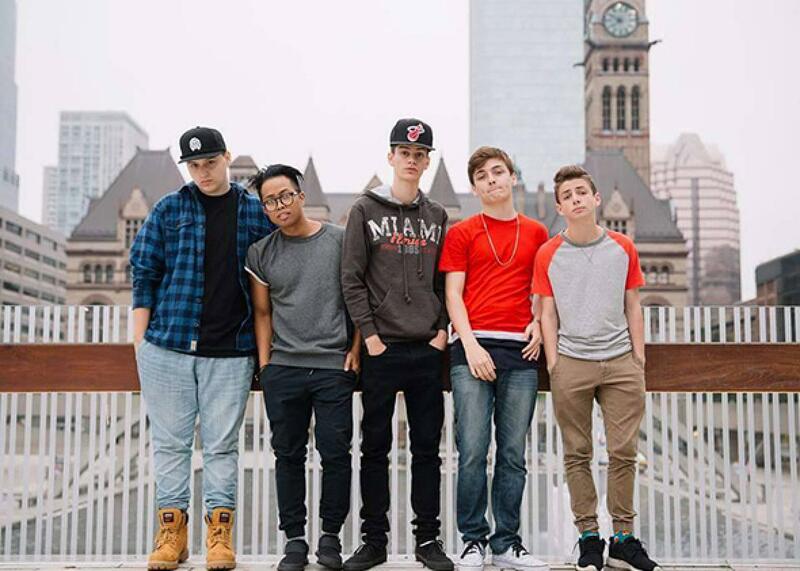 Teens are getting famous on a social network you’ve probably never heard of. YouNow’s 5quad: Timmy Connors, Rudan Custodido, Edwin Burgos, Nick Bean, and Zach Clayton. Today 510,000 people follow Zach’s YouNow handle @BruhItsZach. He can launch a broadcast with no warning and coax tens of thousands of people to check in on him within the space of an hour. A core group of supporters will stay glued to the feed until Zach shuts it down, then disperse across his other social media pages and wait for the next tweet or Snapchat or Instagram like to bubble to the surface. Zach’s Round Rock, Texas, bedroom walls are papered over with handwritten notes sent through the P.O. box his family set up to handle the deluge of fan mail. Also arriving there are plush teddy bears, printed bucket hats, and at least one electric-blue thong. On Zach’s official website, supporters can buy T-shirts that say “My Hero Wears a Bucket Hat” or signed posters of Zach striking a Tiger Beat pose. Through unofficial channels, they can read X-rated fan fiction with titles like BruhItsZach, Under the Sheets; Pregnant By Zach Clayton; and Zachs Toes. YouNow founder Adi Sideman had been tinkering in what he calls “the user-generated video space” for 15 years when everything started clicking for him. After getting a master’s degree from New York University in interactive telecommunications, Sideman launched a series of entertaining but trivial Web games: “create your own car commercial, create your own ringtone, remix your own songs,” stuff like that. But several years ago, he sensed that emerging technologies were tipping in his favor. “All of a sudden, everybody has a camera in their pocket. There’s Wi-Fi everywhere. Social networks allow people to distribute their own content,” Sideman says. “We were all becoming broadcast stations.” He launched YouNow in 2011. In theory, YouNow sounds a bit like Twitter’s real-time video feature, Periscope. In practice, they’re nothing alike. Periscope’s tagline is “Explore the world through someone else’s eyes”; it’s named after a device that rises out of the darkness to take a look around. But on YouNow, you don’t see what the broadcaster sees—you see the broadcaster himself. You click into a stream and stare into his eyes. YouNow’s camera is always set, by default, to selfie mode. The whole site is designed to create personalities and foster fandoms around them. And its features are gamified to keep everyone’s eyes glued to the screen. When a Periscope broadcast is launched, only the user’s Twitter followers get a heads up. But YouNow broadcasts compete for the attention of the entire social network through a roiling leaderboard tacked to the side of the screen. When a Periscope user stops streaming, the screen goes black. When a YouNower signs off, her viewers are instantly pitched into a new stream, where a different broadcaster is challenged to charm the newcomers into sticking around. At first, nobody was paying too much attention. But in the summer of 2014, just as Zach was catching on, traffic to YouNow spiked from 10 million visits a month to 100 million. Now, YouNow says it records 150,000 broadcasts a day and 100 million user logins a month. According to its own internal stats, which we could not confirm, 74 percent of its users are under 24 and 56 percent of them are female. The average user spends 51 minutes on the site every day. There are no ads, but last year, YouNow launched a partnership program that allows for choice broadcasters to earn money through a series of cutesy processes built into YouNow’s cartoonish monetary system: Viewers use real money to buy YouNow bars, which can be tossed into a broadcaster’s virtual tip jar or spent on a suite of virtual “gifts,” like a superpowerful thumbs up (which helps vault the broadcast up the leaderboard) or a piece of heart-shaped fan mail (it unfolds on screen with much animated fanfare). Why would anyone pay money for this stuff? The more popular a broadcaster gets, the faster the comments pop up and fall off his screen and the harder it is for the lowly fam to be heard. (Broadcasters prefer the term fam over the traditional fan—they compare the broadcaster-viewer relationship to a close-knit family bond.) So it’s tempting to splurge on some bars to get your chat comments rendered in bold type or your screen name shouted out in the middle of the screen, right in front of your idol’s eyes. YouNow says $1.5 million passes through the site’s tip jars every month and that it pays out over 50 percent of that to the partners who raised the money. (Zach’s mom Priest confirms that Zach gets this cut, though she won’t say how much he makes. A British YouNow star says she makes 1,500–2,000 pounds a month, and Sideman has said top earners have the potential to make up to $50,000 a year.) And that’s not the only cash coming in: In October, investors gave YouNow $15 million in venture capital funding. When Dooney first stumbled onto Zach’s corner of the Internet last spring, he’d managed “influencers” like 6-year-old Vine jester Lil TerRio and discount-aisle dreamboat Alex From Target, but he’d never seen anything quite like the 14-year-old in the bucket hat. “His supporters are on another level. I can’t even explain it,” Dooney told me recently. Alex From Target, for instance, has seven times as many Twitter followers as Zach does. But when it comes to fan engagement—the number of RTs, likes, and comments the guys rack up, tweet for tweet—Zach’s metrics blow Alex out of the water. Zach’s fans are simply more obsessed. “All these kids are getting crazy impressions,” Dooney says, and when they work together, “it’s like the Power Rangers combining to become Megazord.” Under Dooney’s advisement, 5quad members have begun pacing their broadcasts throughout the day to avoid two members competing for the same crowd and to satisfy around-the-clock supporter interest. Now, when Timmy says goodbye to his viewers, they say hello to Rudan. A YouNow broadcaster has yet to jump from the leaderboard to the Hollywood A-list. Social media stars borne of more established platforms are still busy building inroads to traditional media by way of book projects, live tours, and direct-to-digital features like the teen comedies Camp Takota (featuring YouTube comediennes Grace Helbig and Hanna Hart) and Expelled (a vehicle for Vine heartthrob Cameron Dallas). Reality television is more welcoming: The Amazing Race cast its latest season with 22 social media stars, and America’s Got Talent is now holding some auditions directly on YouNow. Last week, the group released its first EP, Trenz, directly through Dooney. My personal favorite of the three heavily processed hip-hop tracks is the techno-farce “Wifi Wifey,” which begins: “Do you double-tap like me?/ When I’m on the road you can Skype me/ I’ll follow if you follow me back/ You my wifi wifey.” It’s not a mainstream hit, but the fams are loving it. The real potential in YouNow celebrity is not that broadcasters will become movie stars some day—it’s that social media broadcasting will soon subsume film as the world’s trustiest star-making vehicle. Last year, Variety surveyed a set of 1,500 American teenagers and asked them to rate a raft of Hollywood and social media stars on various markers of influence. The top five slots went to Smosh, the Fine Bros., PewDiePie, KSA, and Ryan Higa—all YouTube vloggers or duos. Like a mini-Hollywood, YouNow even feeds its own little tabloid machine. The anonymous gossip Twitter account @YouNowConfessed publishes provocations like “Zach is so Hollywood now” and “5quad has a lot of drama tbh,” while a 5quad fan news feed tracks the boys’ online movements, alerting followers to developments like “Zach was on Instagram 18 minutes ago” and “Edwin’s popping into DMs.” Encountering a squad member in the flesh is the ultimate thrill. Last month, one fan followed 5quad’s social media down to the Santa Monica pier, jumped into Conners’ opened arms, wrapped all four limbs around his trunk, and stayed suspended there for 15 seconds.